Sync ACT! with Exchange. Direct Exchange access via Microsoft's Mapi interface is supported as well as the Outlook interface. Use Outlook to sync with Office 365, iCloud, Google, or any other cloud service that supports Outlook/Exchange. ACT! Server Resident. Install 123 Sync on the ACT! server and sync with Exchange. Independent 123 Sync 2012. Install 123 Sync on an independent machine and sync ACT! with Exchange. Sync ACT! with local, offsite or hosted Exchange. Sync phones, smartphones, tablets, and any device that supports corporate Exchange synching. You can have iPhones, Blackberrys, Androids, etc., all working on an single environment. Each device uses its own native addressbook interface without the need to install memory and power hogging applets. Native sync to all your devices. 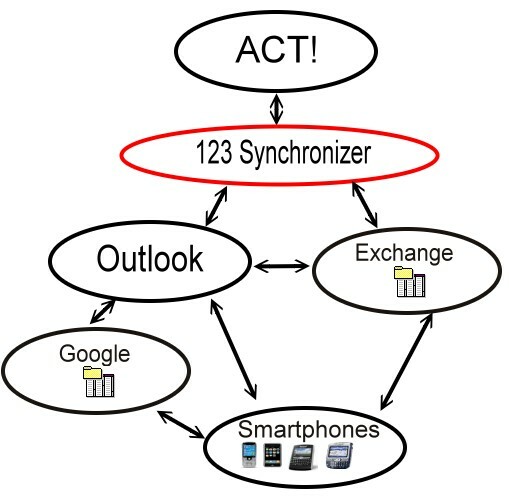 Whether your device syncs wireless or wired with your Exchange server, 123 Sync puts them all at your ACT! fingertips.